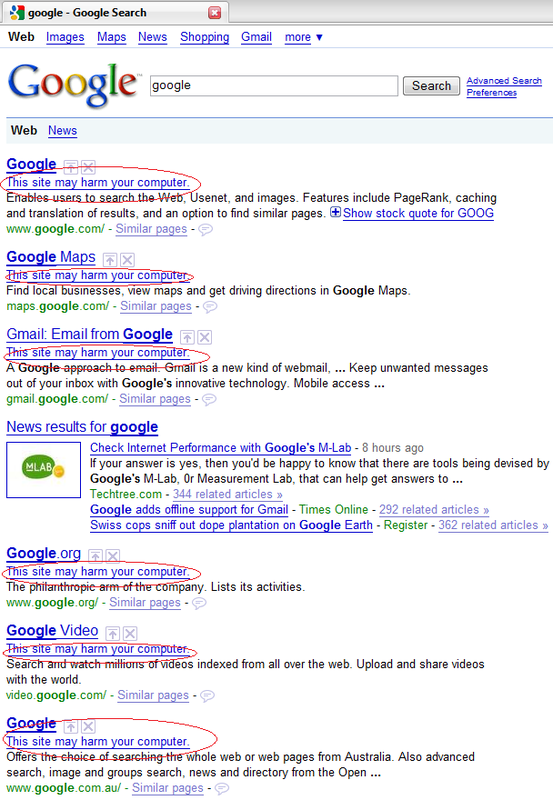 Is Google Crazy? Google.com May Harm Your Computer? I just searched something in Google, I found all search results are marked "This site may harm your computer", even including Google self! Google.com May Harm Your Computer? The problem now appears to be fixed. "This site may harm your computer" on every search result?!?! Next article: Official Google Chrome on Mac OS X: Coming soon! I just searched google for some plugins, and had exactly the same problem as you. But after 5 minutes, everything seems back to normal. I have read an article about this,it said that it was a human error that caused the surprising event. And malware checking both involve human and machine work. I am constantly surprised that things run as smoothly as they do, compare it to when you have to deal with plumbers etc and you realise that mediocrity is the norm.